Market factors and aggressive campaigns by other manufacturers can free up purchased equipment for surplus re-sale. For example, if Honeywell successfully bids to convert a plant from Foxboro to Honeywell, the warehouse or stores equipment may become available for bid…allowing us to procure it and sell it at a discount. This surplus or “never used” material is available with the maximum possible discount over factory rates. 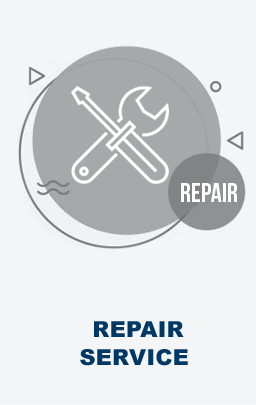 Close inspection of transmitters will reveal to the trained eye whether an item is new surplus or has been reconditioned. Areas of concentration are the process flanges, electronics housing (electronic only) base plates and mounting surfaces (case controllers and recorders only). These focal points can enable someone with limited experience to quickly ascertain if an instrument has seen process conditions. First, the process flanges are always good indicators of the history of a unit. New surplus process flanges will have process threads (1/4” usually) that are free of service residue and liquid teflon sealant (excluding teflon tape which we use to calibrate instruments). They are also generally dull in finish (316 ss only) and the process surfaces are free of pitting, scoring and wrench scarring. Carbon steel process flanges will be a very dull gold finish due to the oxidation of cadmium plating. We upgrade whenever possible to 316 ss for surplus items because of its resistance to corrosion over time and its availability. 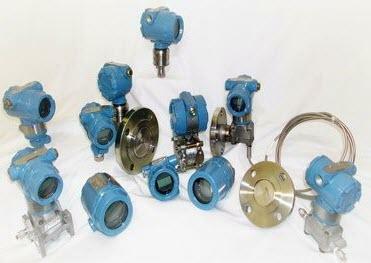 All process flanges will deteriorate over time and with exposure to the elements of process or environment. 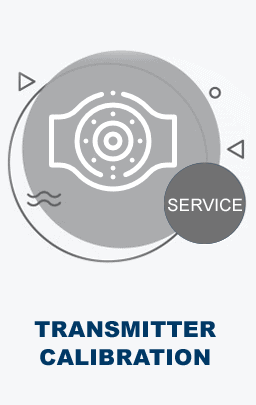 For this reason, all reconditioned transmitters have flanges that are blasted with glass beads leaving their metal surface shiny. This is the most obvious sign of a re-worked unit. Carbon steel that has been reconditioned will have a new cadmium plated luster that is similar in appearance to polished gold. Second, the electronics housings will further attest to the state of the instrument. On electronics housings, new surplus can be identified by inspecting the interior of the housing. Surplus will always have either anodized bronze coloration Rosemount or a combination of bronze coloration and factory paint Foxboro. This coloration is actually a type of plating that ranges in intensity from goldish-silver to dark bronze depending on the length of exposure to the medium and age of the surplus unit. Reconditioned, on the other hand, will almost always be blasted which removes this finish and leaves only a dull aluminum finish. The lids for the housings will have a similar appearance, with the insides being bronze colored on surplus and aluminum on reconditioned. The external appearance of the unit can be easily identified as reconditioned by the differences in paint. New surplus will have the factory colors of Rosemount (light blue is descriptive) or Foxboro (green, gray, blue and aluminum, [dark green, gray and green-blue are descriptive]) while reconditioned units will have darker shades (Rosemount) or lighter shades (Foxboro) which indicate that we have blasted and repainted the unit’s components. Third, the internal mounting surfaces and plates forFoxboro controllers and recorders as well as the cases are easily identifiable as surplus and reconditioned because of the finish of the components. Surplus components will have factory paint while reconditioned units will usually be cadmium plated or painted off-factory colors. Factory colors are Foxboro green, gray, blue and aluminum (dark green, gray and green-blue are descriptive). Off factory colors are purchased from local suppliers from shelf stock. These three methods are the quickest and simplest methods for discerning new surplus from reconditioned. They do however rely on common sense and a knowledge of the instrument that is being verified. All Foxboro’s for example, do not have the same color schemes, degree of plating or the same manufacturing process, since there are literally 60 years of instruments that have been produced. All surplus is not necessarily the latest style or run and has not necessarily been manufactured within the last few years. Some surplus can be decades old while others might be of recent distribution. All surplus is not necessarily free of touch-up from The Transmitter Shop. The older the material the more likely we are to touch it up because of minor nicks due to carelessness. This does not sacrifice the authenticity of the surplus transmitter, as it has never been in service. What are the differences at a glance? Reconditioned units will always have 1)blasted flanges, 2)repainted housings, 3)and paint that is other than factory colors. New surplus will always be 1)free of process connection scarring, 2)have original factory colors(touched up if necessary), 3)and easily identifiable as surplus by the factory plating in the housings and on components. Samples of both new surplus and reconditioned units can be supplied as a matter of course to interested parties. Questions, comments or inquiries can be directed to The Transmitter Shop during normal business hours or via our Internet E-mail address.